Before the dawning of a golden era at Elland Road in the early 1960's, following the appointment of Don Revie as manager, Leeds United were famed more than anything else for their association with a staggering talent named John Charles, Il Gigante Buono, the Gentle Giant. In the decade following his arrival at the club as a seventeen year old in 1948, in many ways John Charles WAS Leeds United, an awesome player who dominated everything about a very modest Second Division club. It is difficult now, more than forty years after his heyday, to convey exactly how high his standing in world football was. In the eyes of many experienced judges, he was considered for a time the best player in the world, and certainly prior to Revie's era the best player Leeds United had ever fielded. He was transferred to Juventus in 1957 for a world record fee, scored 29 goals in his first season in the defensively supreme Serie A, won the Italian Footballer of the Year award and prompted the club to three championships and two cups in his five years in Turin. In 1997 he was voted as the best ever foreign player to have played for Juve, he still holds the season's scoring record for Leeds and before Ryan Giggs Charles was the youngest ever Welsh international. Quite simply, the man is one of the finest footballers ever to draw breath. 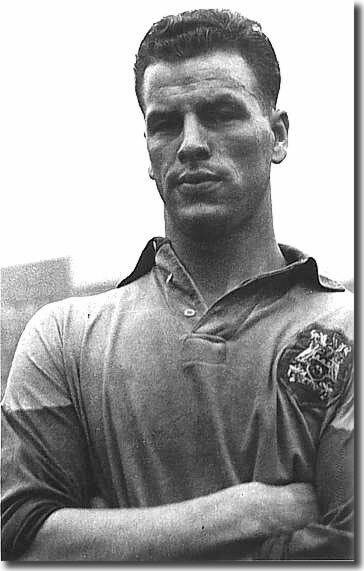 John Charles was a wonderful sight on the football field, bristling barrel chest, agile, quick and strong, a world class performer either in defence or up front, adept at playing in midfield or seemingly wherever else the fancy took him, a talent revered the world over, and he managed to combine all that with a humility and generosity which has always made him a truly unique character. It must have been a sight to watch him play with the flags flying high on the commercial flagpoles above the field and the excitement of the crowds in the stands. Rarely has a footballer earned such popularity across one nation, let alone the three which Charles counted as his homes. He remains to this day one of the favourite sons of Juventus in Turin, welcomed back whenever he returns to the land of his greatest triumphs. Many players have been famed for their versatility, skilled at playing in many positions, including Paul Madeley who came later to West Yorkshire, but it is inconceivable that any other footballer before or since has been quite SO good in such very different roles. Tom Holley, who was the Leeds United centre half whom Charles replaced when he first emerged at Elland Road, later became a journalist and recalled praise from England's top centre forward and centre half of the time. He wrote: "Nat Lofthouse was asked who was the best centre half he had played against and without hesitation named John Charles. The same week Billy Wright was asked who was the greatest centre forward he had faced, and he again answered John Charles." Eventually measuring 6ft 2ins tall and weighing in at more than 14 stone (although when he returned to England to Italy he tipped the scales at 15 and a half stones), Charles first broke through into the Leeds side as a raw young centre half, but quickly matured into the finest defender in the country, unbeatable in the air and unpassable on the ground, ever ready to break out of defence and storm through the opposition's ranks. Jack Charlton: "When he went on a surge he would leave a terrible trail of human devastation behind him. Bloody gentle giant indeed!" Broadcaster Michael Parkinson: "John Charles was the complete footballer. In Italy they would play him up front until he scored, then switch him to centre half to stop the other side scoring. That seems to me to be the perfect all rounder. "I first saw John play when I went to Elland Road to see Barnsley take on Leeds, who had those wonderful blue and gold quartered shirts in those days. 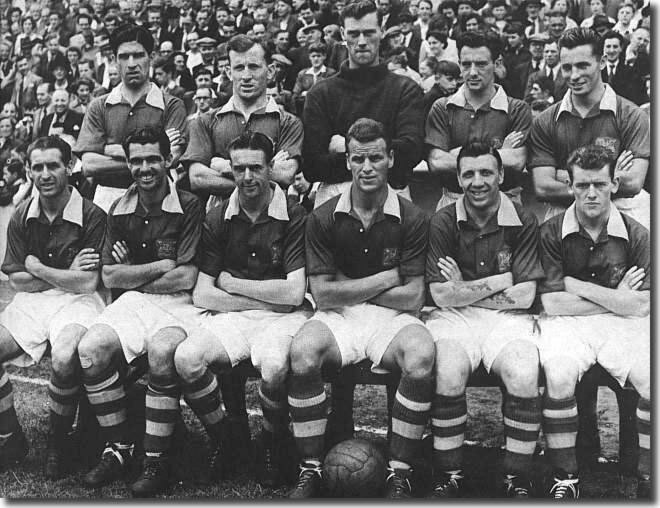 We had a centre forward at the time called Cecil McCormack, who broke every Barnsley record in his first season, and the big test was always going to be John Charles. John put our wee man in his pocket for 89 minutes, then in the 90th Cecil got a chance and scored. So honours were just about even. "Even as a purblind Barnsley supporter, I thought John was a fantastic player. He was a star. You couldn't take your eyes off him on the field. I thought that if he'd been in our team, we'd have won every cup there was." Full back Jimmy Dunn: "You could see he was marvellous when he arrived, so dainty for a big man and he wouldn't go in with a shoulder charge. Other players could pull him down and kick him but he never lost his temper." In fact Charles was shy and retiring when he started, and not convinced totally of his abilities. He worked hard to improve his technique. "I didn't have it all there - I had to practice a lot, I can assure you. I used to go down the back of the big stand with Major Buckley and would keep hitting and hitting the ball. Throughout the three months summer break I was working every day at jumping. When I first came I only used to jump a foot off the ground. That's the way I improved it." Captain in the Fifties, Tommy Burden, recalling the only time he ever saw Charles lose his temper: "Someone was pulling at him as he was going down the byeline and John turned on him. I had to shout across. I've not seen the likes of him ... he was superb in every way. He made things look so easy." But immense as he was at the back, Charles was even more impressive as a forward, still supreme in the air, but now also displaying a rare touch, delicacy and ball control for such a big man, boasting a powerful shot and becoming the scourge of defenders wherever he went. He scored 42 goals in 39 games for Leeds in 1953-54 and was the match winner in each of his first three appearances for Juventus, rare achievements indeed. The late Danny Blanchflower, captain of the glorious Tottenham side of the early Sixties: "Everything he does is automatic. When he moves into position for a goal chance it is instinctive. 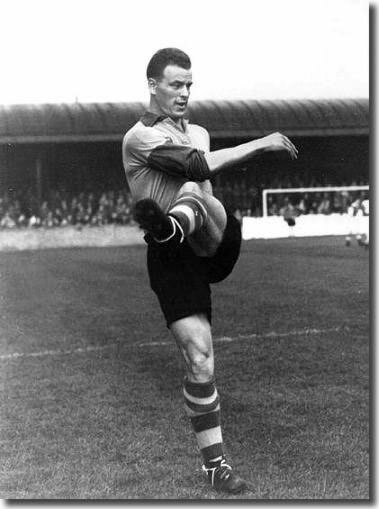 My feet do not do my thinking for me as they do for a player like John Charles. That is why I can never be as great a footballer as he." Jack Charlton: "John Charles was a team unto himself. People often say to me, 'Who was the best player you ever saw in your life? ', and I answer, probably Eusebio, di Stefano, Cruyff, Pele or our Bob - but the most effective player I ever saw, the one that made the most difference to the performance of the whole team, was, without question, John Charles. He could defend, he could play in midfield, he could attack. He was quick, he was a very, very strong runner, and he was the greatest header of the ball I ever saw. His power in the air was phenomenal. Normally when a player heads the ball his eyes close automatically, but John's didn't, they stayed open. If you tried to challenge John in the air, he'd always jump a fraction of a second earlier, and he seemed to be able to hang in the air. He'd lean on you, he'd put his chest on your shoulder and lean on you, while heading the ball into the net. "The balls you used to head in those days were nothing like the ones today. The balls today don't absorb water, they stay the same shape throughout the whole game. In those days, a keeper often had difficulty punting the ball out of his own half of the field because it was so big and heavy. On a really wet day, the ball got heavier by the minute. If you headed it wrong, you sort of stood there groggy for five or six minutes before you recovered. "John was always known as the Gentle Giant. He'd never go through somebody or kick them from behind, as centre backs often did in our day. But John used to run with his arms stretched out, and he was so big and strong, you just couldn't get close to him without being whacked. I remember one guy getting too close to him and being knocked clean over by these massive, powerful arms. "They may have called him the Gentle Giant - but when it came to the tricks of the trade, John was right up there with the best of them!" Despite Big Jack's words, Charles never had any trouble with referees. He was never booked, sent off or even spoken to by a referee in a lengthy career in Yorkshire, Italy and Wales and will always be remembered for his icy cool and self discipline, as well as his amazing footballing skills. Shrewd judges of talent quite rightly include Charles' name in any list of the world's best and he is feted by many as Leeds United's greatest ever player, even above greats such as Bremner, Giles, Clarke, Lorimer and Cantona. The esteem with which he is still held in Italy is a testament to the standing of the man.